The HSMAI South Florida Chapter is now accepting Scholarship applications from students pursuing careers in hospitality sales and marketing, general hospitality management or revenue management. Scholarships are awarded based on merit and complete eligibility criteria and requirements are outlined on the HSMAI South Florida website. Applications must be submitted by June 30, 2019 and winners will be announced by July 31, 2019 and awards will be issued for the Fall 2019 school year. CONGRATULATIONS to this year's winners of the HSMAI South Florida Dr. Peter Ricci Scholarship!!! We are super excited to announce that Sabrina Schmid of FAU Hospitality & Tourism Management and Flavia Adorno Pedra of FIU Chaplin School of Hospitality & Tourism Management were awarded during the 35th HSMAI South Florida Hospitality Awards Gala on November 16th at the Margaritaville Hollywood Beach Resort. 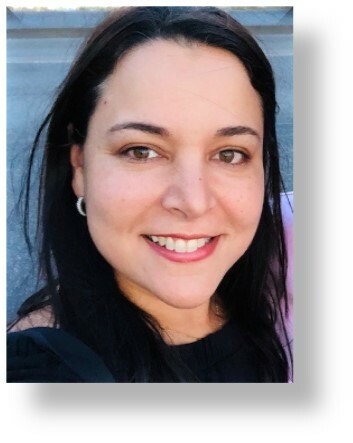 This scholarship fund, created by HSMAI South Florida former president Carmen Ackerman, was designed to provide educational funds for students enrolled in either undergraduate or graduate hospitality/tourism/culinary programs at South Florida institutions. HSMAI South Florida covers the wide swath of geography from Jupiter down to Key West and over to Naples/Ft. Myers. Students can apply and receive funding based upon the merit of their application, their personal achievements, and their career goals. CONGRATULATIONS to this year's winners of the HSMAI South Florida Dr. Peter Ricci Scholarship!!! We are super excited to announce that Francine Coker of FAU Hospitality & Tourism Management and Juan Tamayo of FIU Chaplin School of Hospitality & Tourism Management will be awarded during the 34th HSMAI South Florida Hospitality Awards Gala on November 10th at the Turnberry Isle Miami, Autograph Collection! 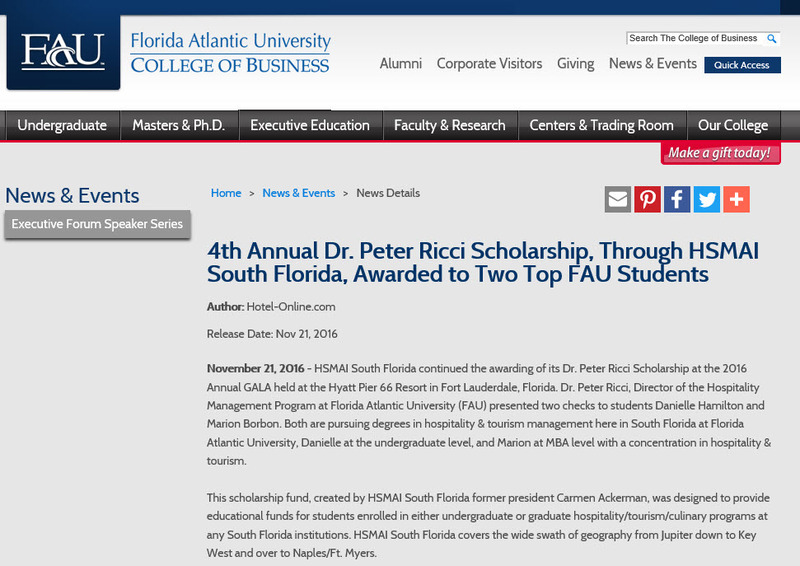 November 21, 2016 - HSMAI South Florida continued the awarding of its Dr. Peter Ricci Scholarship at the 2016 Annual GALA held at the Hyatt Pier 66 Resort in Fort Lauderdale, Florida. Dr. Peter Ricci, Director of the Hospitality Management Program at Florida Atlantic University (FAU) presented two checks to students Danielle Hamilton and Marion Borbon. Both are pursuing degrees in hospitality & tourism management here in South Florida at Florida Atlantic University, Danielle at the undergraduate level, and Marion at MBA level with a concentration in hospitality & tourism. This scholarship fund, created by HSMAI South Florida former president Carmen Ackerman, was designed to provide educational funds for students enrolled in either undergraduate or graduate hospitality/tourism/culinary programs at any South Florida institutions. HSMAI South Florida covers the wide swath of geography from Jupiter down to Key West and over to Naples/Ft. Myers. Students can apply and receive funding based upon the merit of their application, their personal achievements, and their career goals. The career interests must align with HSMAI in the areas of hospitality sales, marketing, or revenue management including ancillary areas of eCommerce, digital marketing, travel product/service distribution and related nice segments. South Florida is home to a high number of college-level hospitality & tourism programs and is has one of the most diverse student populations in the country. Dr. Ricci was singled out for the naming of this scholarship honor based on his years of service to HSMAI, his passion for education, and his 20 years of experience in hospitality industry leadership roles such as a hotel general manager. His vision for empowering students to achieve excellence strongly encouraging their affiliation with HSMAI and other hospitality associations so that, early on, they begin to network, grow, and learn within their anticipated career segments. As a living role mode to the students he shows his commitment with current memberships in MPI, HSMAI, SGMP, FRLA, AHLA, CMAA, PBCHLA, and others. As seniors in the Hospitality Management program at Florida Atlantic University, we have learned a lot about this unique industry. Being twins has allowed us to experience this journey together where we were also able to learn about ourselves as individuals. We first started our paths to the field by taking Culinary Arts at Atlantic Technical High School in Coconut Creek, FL. The passion that the people had in that field and their amazing and heartwarming personalities are what ultimately led us to our chosen major. Hospitality Management combined the customer service aspect that we loved about Culinary along with the academic rigor we were looking for that came along with getting a BBA in Hospitality Management. Getting a BBA in Hospitality Management at FAU is a great combination between hospitality coursework and rigorous business courses that are an essential foundation to working in any business. We inevitably came across Dr. Peter Ricci before declaring our major, who has become the best mentor and professor in hospitality that we could ever ask for. He truly is a hospitality expert and is nothing but passionate for giving his students the best of the best, whether it be jobs, advice or knowledge of the field. 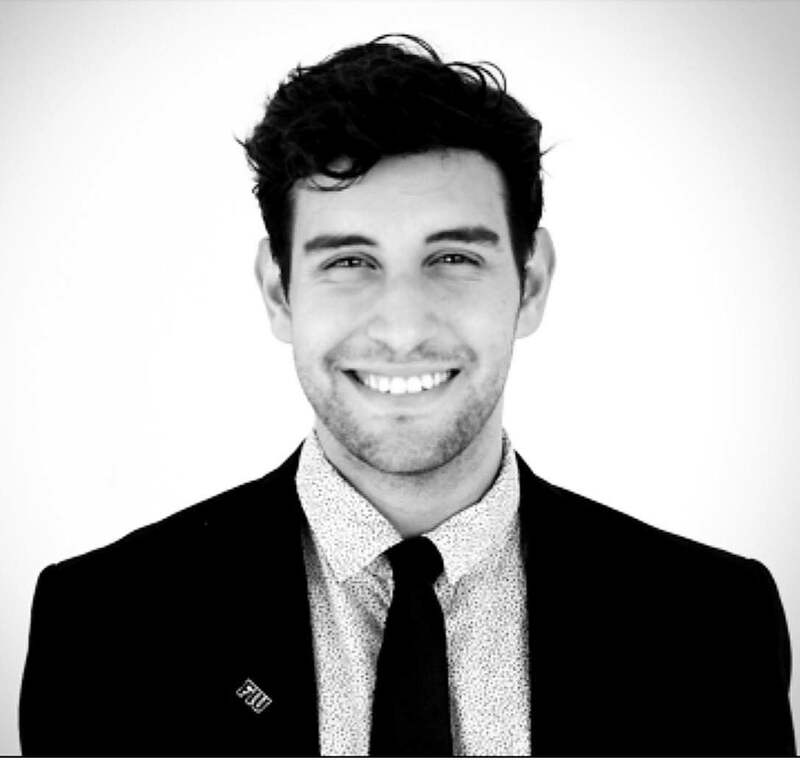 We have also been awarded many scholarships this past year including this year's Dr. Peter Ricci scholarship through HSMAI. In addition, we have also been awarded the American Hotel & Lodging Association scholarship, Palm Beach County Hotel & Lodging scholarship, and FAU College of Business Scholarships. The HSMAI scholarship awarded in Dr. Ricci's name is the ultimate honor and we are delighted to be given a scholarship that means so much to us. 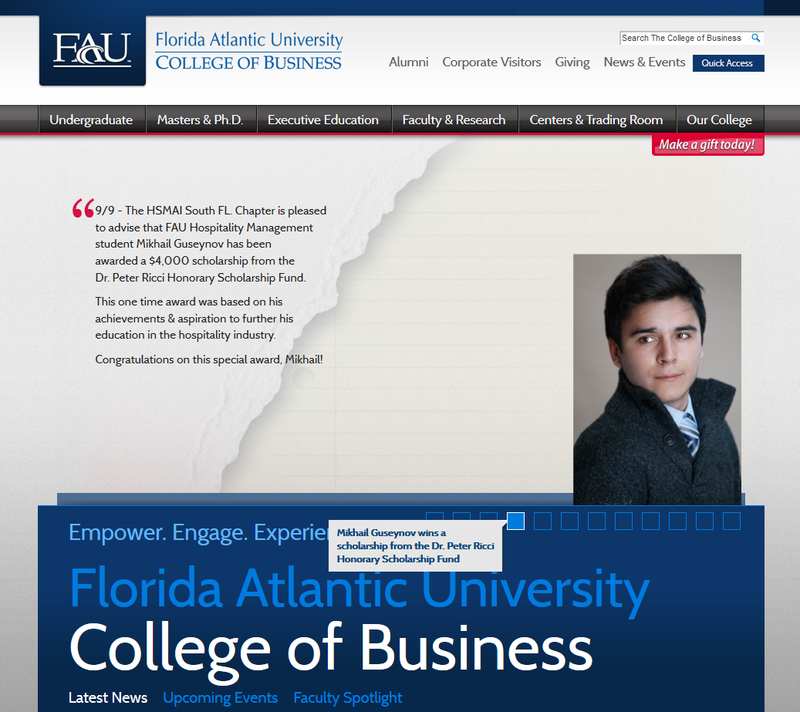 The opportunities that we have come across during our time at FAU have been phenomenal. We were both able to gets jobs in our field relatively quickly. 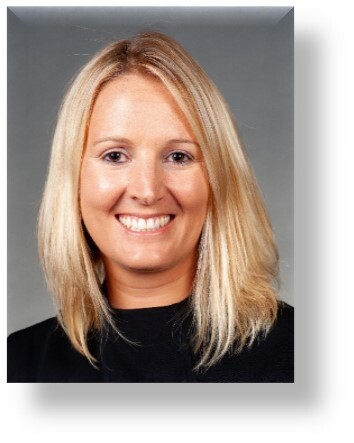 I (Tara) began as a front desk agent at the Hampton Inn & Suites near the Sawgrass Mall in Tamarac and have been happily working there ever since. While working there, I was given the opportunity to learn about sales and quickly took a liking to it. In addition to my front desk job, I did a summer digital marketing internship at the Boca Raton Resort where I learned a lot about hotel marketing. Because of my experiences of working in a hotel, I am currently considering a career in hotel sales and marketing upon graduation. I would love to get 1-2 years of experience before going back to school for a Master's degree. 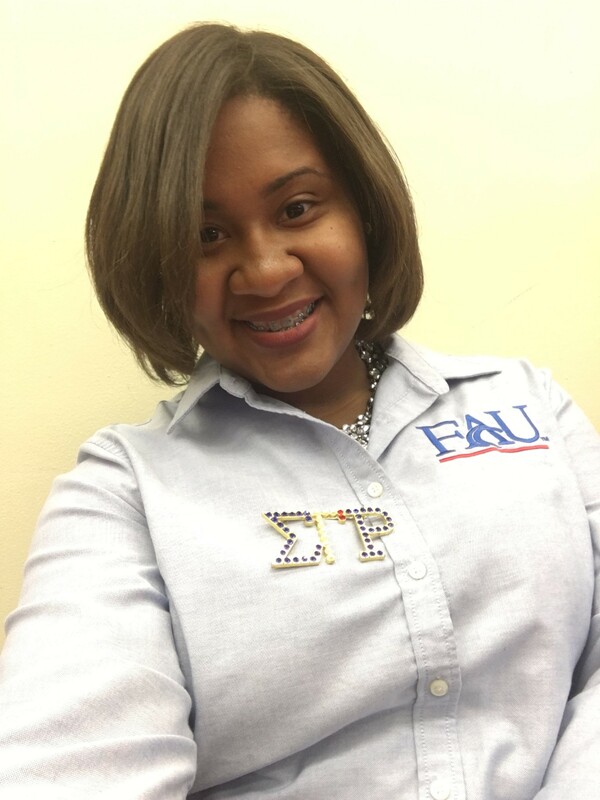 I (Nicole) have been through a number of jobs in the hospitality industry, ranging from office work, an events internship and a manager in development program at the Boca Resort. Currently, I am training to be a front desk agent at the Hyatt Place Fort Lauderdale Airport & Cruiseport. I believe my passion lies with events and marketing, and can see myself happy in a position that combines both. I also have a goal of obtaining my Master's degree in 2 years.